The city of Peoria offers growing businesses, entertainment and safe, affordable living. Whether you’re an individual or a family, Peoria has something to offer everyone. Peoria Eighty Three, Peoria’s entertainment district, offers Spring Training baseball, shopping, live theatre and more. If you’d prefer a quiet night in, Peoria offers a range of different dining experiences and a variety of cuisines such as Italian, Barbecue, Mediterranean, and Mexican. 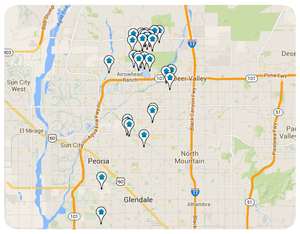 Peoria’s access to the Loop 101 makes traveling and commuting around the valley is easy.